The U.S. dollar hit a 4 month high last week from concern over potentially faster interest rate hikes to control inflation as oil exceeded $70 per barrel and the lowest unemployment since 2000 was reported. If the U.S. dollar continues to strengthen, it may be useful to know how U.S. equities moved historically in times when the dollar rose. Given each size, style and sector has different exposures to the U.S. dollar, there have been differences in the performance of each. 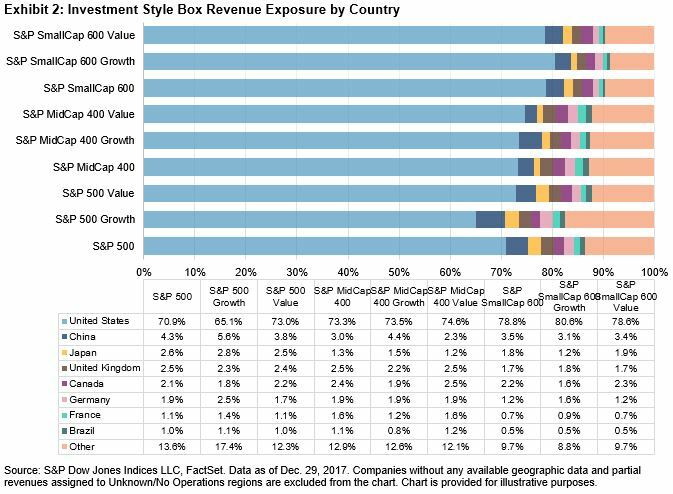 Naturally the largest companies do most international business so have a greater portion of revenues coming from outside of the U.S. Notice in the table below from S&P Dow Jones Indices research that the S&P 500 has 70.9% of revenue from the U.S. That is less than the 73.3% of U.S. revenue in the S&P MidCap 400 but is much less than the 78.8% of U.S. revenue generated in the S&P SmallCap 600. 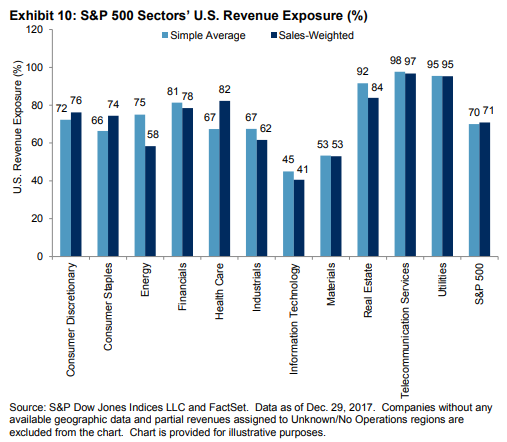 Also, in a recent S&P Dow Jones Indices research paper, an analysis showed the percentage of revenues from the U.S. by sector. For illustrative purposes, two methods were used to measure the percentage of U.S. revenues, and the results were relatively in line for each method. Energy showed the most difference between the methods since the three biggest companies in that sector contributed heavily to the overall revenues. Notice the real estate, telecom and utilities sectors have the highest percentage of revenues domestically. 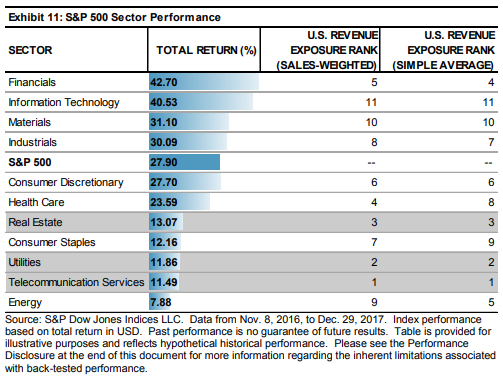 Therefore these sectors underperformed in the period measured in the aforementioned paper that was from Nov. 8, 2016 – Dec. 29, 2017, when the U.S. dollar fell roughly 7%. Likewise, during this period, the technology and materials sectors that have the greatest percentage of revenues coming from overseas, outperformed significantly. While the percentage of revenues breakdown by the U.S. and international matters for performance as the dollar fluctuates, in some cases, the companies hedge or partially hedge currency moves, so the currency impact is muted. Further, there are other factors that may drive outperformance more than the dollar moves. For example, the energy sector underperformed with a falling dollar and rising oil prices, despite having relatively low revenues from the U.S., since many companies hedge against oil price moves to reduce volatility of revenues. An interesting finding when comparing the impact on U.S. equities from a falling dollar versus a rising dollar is that the sensitivity to the falling dollar is much greater, though the U.S. equities rise on average in either case. This is much in-line with findings that U.S. equities have historically risen more with interest rate cuts than with hikes, but that with growth, equities can still rise with rates. On average, the S&P 500 rises 3.7 times more from a falling dollar than a rising one, perhaps since a falling dollar helps the international business, and companies can hedge portions of their international revenues if the dollar rises. The S&P MidCap 400 is 3.9 times more sensitive to a falling dollar than rising one since a falling dollar gives the mid-size companies a chance to grow international business when the dollar falls. The mid caps also performed best with the falling dollar. The S&P SmallCap 600 is 3.1 times more sensitive to the falling dollar than a rising one but does better than large- or mid-size companies when the dollar rises. On a sector level, materials, financials and energy are all driven more by a falling dollar than a rising one, though energy and materials actually fall with a rising dollar. This is since the underlying commodities are priced in dollars so the dollar is a powerful driver of these sectors; however, the downside capture ratio when the dollar falls is much greater than the (small negative) upside capture when the dollar rises, so the companies may be skillful at hedging their downside from falling prices of raw materials. Also, the falling dollar helps the mid-size tech companies significantly more than a rising dollar. This is since technology has a relatively large portion of revenues coming from outside the U.S. and the mid-size companies have extra room to expand before they mature. Overall, the S&P SmallCap 600 benefits most from a rising dollar from its heavier U.S. revenue concentration. On average, historically in the past ten years, for every 1% the dollar rose, small caps gained 95 basis points, mid-caps gained 82 basis points and large caps 71 basis points. 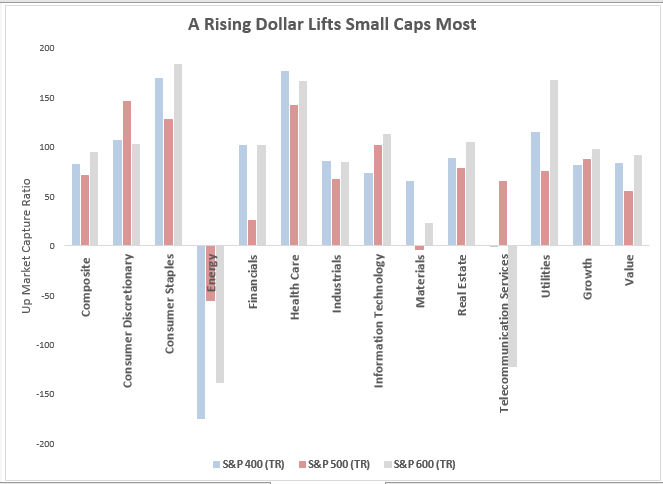 Small-caps in financials have outperformed their bigger counterparts with rising rates. The financial large-caps have about 20% of their revenues internationally whereas the smaller banks are likely more local so do better (though aren’t that sensitive, rising just 26 basis points per 1% dollar increase) with a rising dollar and with rising rates, but when rates don’t rise, utilities have fared better. The bottom line is that a rising dollar is not harmful for most stocks, especially small-caps; however, all else equal – energy is too sensitive to the downward pressure on oil with a strengthening dollar. Endnote: Exhibits, 2, 10, and 11 were prepared by my colleague, Phillip Brzenk. Exhibit 2 appeared in Brzenk, P. “How Global Are the S&P 500®, the S&P MidCap 400®, and the S&P SmallCap 600® Style Indices?”, S&P Dow Jones Indices, February 2018. Exhibits 10 and 11 are from Brzenk, P. “The Impact of the Global Economy on the S&P 500®”, S&P Dow Jones Indices, March 2018. The posts on this blog are opinions, not advice. Please read our disclaimers. Copyright © 2019 S&P Dow Jones Indices LLC. All rights reserved.